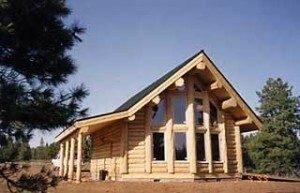 At Cascade Country Cabins we’ll introduce you to ideas and workmanship rarely seen in the log home industry today. Our homes are constructed with well seasoned lodgepole pine for minimum shrinkage with an average of 10″ – 12″ diameters. Our log walls are held together with continuous full length rods to give your home a tight secure fit. Packages are pre-built in our warehouse. Chinking and other options available. Shipping charge and crane charges extra. Allow 10 to 12 weeks for shipping and completion of cabin after placing your order. 50% down payment upon placing your order. Final 50% upon kit completion at warehouse (before shipment).